The Name of the Wind is a story set within a story. The tale begins with an inkeeper, named Kote, who is a relative newcomer blending into the daily life of a remote village. He is a haunted man, one with a secret past. When a Chronicler locates him in the wake of a portentous attack from a supernatural creature, Kote acknowledges his true identity (as Kvothe) and agrees to allow the Chronicler to record his story. Names are important things, and Kvothe has gone by many. The main body of The Name of the Wind is Kvothe recounting the stories of his life and the origins of some of his many names. I had given up on the fantasy genre for a long time. Part of that was just being a busy mom of little children, and part of it was a general lack of stories that spoke to me and had the epic scope I was craving. The story that first brought me back to fantasy was Brandon Sanderson's Mistborn [which I guess I'll have to review for you another time 😉]. Not long after, though, I found The Name of the Wind and was absolutely blown away by the depth of Rothfuss's world building, character development, and his obvious love of the arts. The Name of the Wind has a fairly typical pseudo-medieval, western European, fantasy vibe. What makes it stand out so vividly to me is the details with which Rothfuss fills his world. Kvothe's early childhood among the Edema Ruh (nomadic bands of traveling entertainers) is lovingly rendered to the point where the reader can practically smell the campfires and feel the crunch of leaves underfoot. Later, when Kvothe comes to enter the Arcanum, it felt so immediate, like I was the one attempting to gain entrance to the famous school. Woven throughout the book is Kvothe's, and presumably Rothfuss's, love of performance art in all its varieties. Growing up as a child of traveling entertainers, Kvothe is a consummate performer. He quotes poetry and lines from plays at the drop of a hat, and is wildly creative when it comes to music. Honestly, his performances are probably my favorite part of the story. There is something magical about the way Rothfuss conveys what goes on in Kvothe's head as he plays music. It makes me want to be a better pianist and singer. 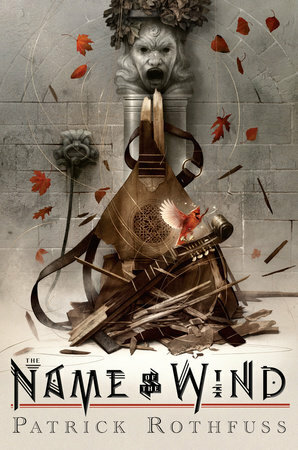 If you're looking for a great fantasy novel, look no further. And be sure you check out the 10th anniversary edition. It's got 50 pages of extra content!